After Medellin moving through Quagmire chronologically we come to Talavera. Cuesta’s Spanish Army has united with Wellesley’s British and have settled on a defensive posture. The British Army is organised as the Spanish in five small divisions, one of which is cavalry. The individual units have much better initiative ratings than the Spanish (mostly 3) and Wellesley himself, with a command rating of 3 can keep all of his force in command, as long as they are within the four hex command range. Cuesta has six infantry and two cavalry divisions. For the French Victor has I Corps, Sebastiani most of IV Corps, Latour-Maubourg with the 1st and Milhaud with the 3rd Cavalry and Joseph with the Reserve. Worth pointing out Joseph is an Officer-Commander as he has a formation designation in his counter; this means he must put the Reserve into command and then command one other unit or divisional attack. The other French officers rely on their own initiative. Played on a half size map the northern half is taken up with the various hills and villages of the Sierra de Segurilla, which historically formed a flank to the Allied deployment. The action happens in the bottom left quadrant where the British are deployed on the Cerro de Medellin and behind the Arroyo de La Portina. At the redoubt half way down (at Pajar de Vergara) the Spanish take up the line, deployed a little more forward down to the walled town of Talavera. The rules don’t say this, but I assume units behind Town walls defend as in a chateau if attacked. One feature I do not understand is the redoubt at the north of the British line, at Cortijo de Valdelfuente. Oman’s History does not mention this feature, and as it was in the British line I am sure he would have. I left it there as the designer has other sources I do not have; it did play a significant part in my refight. Played as always solo, with the ‘In Command One Hex’ House Rule from Napoleon Against Russia* and the ‘artillery moves like trains’ rule, which proves important. 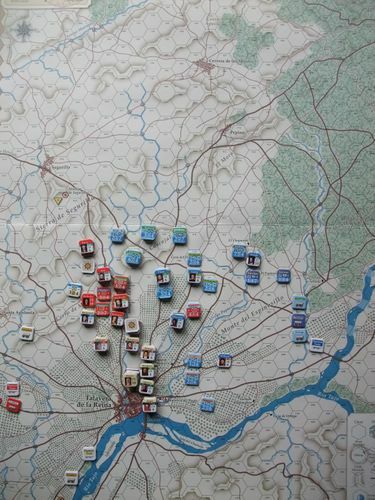 Before the action started the Mode Cards determined the Allies received replacements and I Corps was in road column. This delayed the initial French advance as the Corps had to reorganise and it was not until 11am the French advanced. Their attack was on the north and east of the Medellin, with the Latour-Maubourg’s cavalry engaging with the British around Segurilla. Barros’ Brigade quickly took the Valdelfuente redoubt and then held it, but the rest of the French attacks were thrown back, leaving him and his men isolated. Bassencourt’s 5 Spanish Division and Alburquerque’s cavalry has marched to cover the gap in the Allied north; they isolated the redoubt, but neither they nor the British could evict Barros. [British and Spanish units cannot cooperate in an attack]. Indeed British repulses from the redoubt left the head of the Medellin exposed. The French attack was held up as guerrillas raided I Corps supply lines [Card play putting I Corps out of supply for two turns]. Two bands of guerrillas then appeared in the woods to the east and threatened to cut the French supply line across the bridge over the Rio Alberche. [Guerrillas behave like vedettes, so could not attack the supply trains. But they could create a roadblock on the bridge, which would need infantry to clear it]. Joseph sent back part of the Guard to deal with this threat. One guerrilla band dispersed; the other was seen off by the Guard cavalry which crossed the bridge before the Spanish reached it. At 2pm the French attack resumed. In the meantime the British cavalry had been forced back by Latour-Maubourg’s men, abandoning the Segurilla area. The French attack began to wear down the British line, routing part of the 1st Division and driving off a counterattack. Custa had brought this his 1st Division out of the line as a reserve, and now committed them in support of the British. 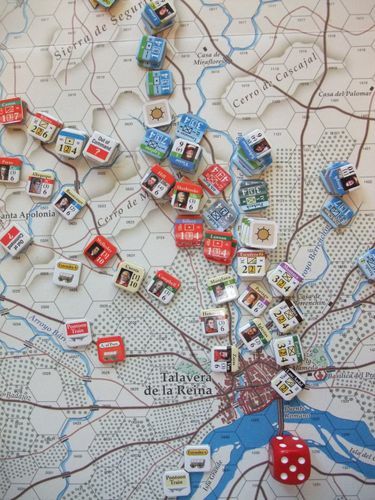 Talavera 2pm the French advance. One problem for the French was getting their artillery into action as they could not advance across the unbridged stream. The Corps and division artillery had to be sent north over the trestle at Casa de Miraflores and then south past the Valdelfuente redoubt. Around 3pm the Spanish finally evicted Barros from the redoubt, but they did not hold the fort for long as they in turn were evicted by the French, who began to work their way onto the hill. Del Parque was killed leading the Spanish 1st Division and replaced by O’Donnell. Campbell’s Brigade pushed into the French rear, only to be destroyed when the attack on the French to his left was repulsed. French and British attacked were pushed back, or among the orchards came to bayonet fighting. Talavera 5pm Hard fighting on the hill. By late afternoon Victor was becoming unnerved by the British resistance [failed his command rolls]. In the centre the French Spanish guard took the Vergara redoubt, only to be driven out by the Spanish 4 Division; Sebastiani occupied it with artillery, but was in turn driven out. On the Medellin the fight swing back and forth, Barros’ men were finally routed and Bellair’s brigade shattered by hand to hand combat, but the British kept being thrown back. O’Donnell was killed leaving the Spanish 1st Division leaderless for the second time. Finally Wellesley himself led an attack. The Poles were routed, the Spanish 5th Division inspired by the advance drove back the French 1st Division in a charge [won a shock combat!] Guye’s French Spanish Guard unit also fell to hand to hand combat, and as night fell the British retook the hilltop. Talavera 9pm As night falls. That was a hard struggle and I felt the Allies had probably lost. So it was surprise to count up the numbers. French losses were 30 SP, Allied 14. One Allied division was demoralised, the Allies controlled 15 of the VP locations and adding in the card VP a Coalition Tactical Victory became a Strategic one. If the French had held the hill on the last turn it would still have been a Coalition Strategic victory, but only Tactical before card VP were considered. I realised as French units have more SP than most Coalition units their loss hits the French harder. So though there were more Allied units in the dead pile, they still added up to less than the French. 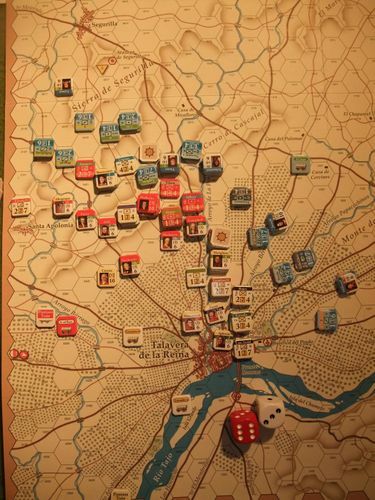 Also most of the French losses (22 SP) occurred in the last three turns, when the French attack was becoming ragged. So a dammed close thing and I need to play this again to see if the French can do better. 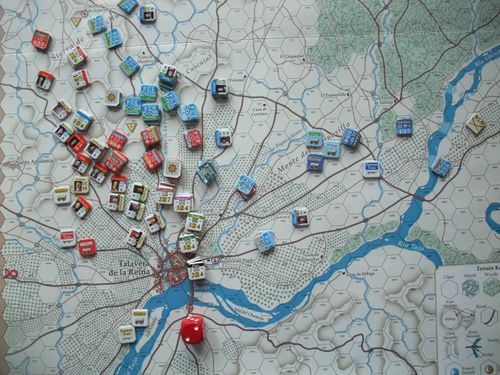 The Allied line is a tough one to crack and the French do not have a numerical advantage in numbers of units. An attack on the Spanish would expose the French to an envelopment from the British – who are guaranteed to move unlike the Spanish. Normally I would move onto the Approach to Battle – but as the Thursday Night Gamers are tackling that I decided to go to Aranjuez next. * For those who have not seen this if an officer who fails his Initiative Die Roll is within 3 hexes of an enemy unit, the leader and all his units within his Command Range are in command, but may move one and only one hex. The units are still Out of Command so may not advance after combat. I share your surprise about "Atalaya de Segurilla" being important, having visited this battlefield many times, as it is quite far and out of the way... except maybe for representing cutting Allied / really Anglo Portuguese supply lines. The French Army never maneuvered in that direction, I am assuming that fearing being cut in half or too dispersed, so it will be most interesting knowing about designer´s intent. Gabriel - I asked Kevin about the redoubt over on ComSim, you can find the conversation here http://talk.consimworld.com/WebX?14@@.1ddc1a45/423 . My own view is as there is no historical mention I know of for a redoubt there (as opposed to possibly a strong farmhouse which would be portrayed as a chateau feature) I am going to remove it for future sessions. Worth pointing out Joseph is an Officer-Commander as he has a formation designation in his counter; this means he must put the Reserve into command and then command one other unit or divisional attack. Great AAR, just setting this up now...re the note on Joseph isn't this suprseded by 25.29 in th exclusive rules for Talavera?